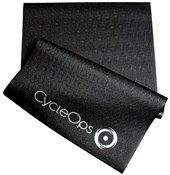 The CycleOps full length trainer mat protects carpet or hardwood flooring from bike grime and rider sweat. This durable rubber mat is designed to be placed under your CycleOps trainer and will absorb vibration and noise so as not to keep you neighbours awake during those late night sessions. With a full range of accessories from Sweat Guards to Riser blocks to Trainright DVDs the CycleOps range is the 1st choice for the competitive and enthusiast cyclist. 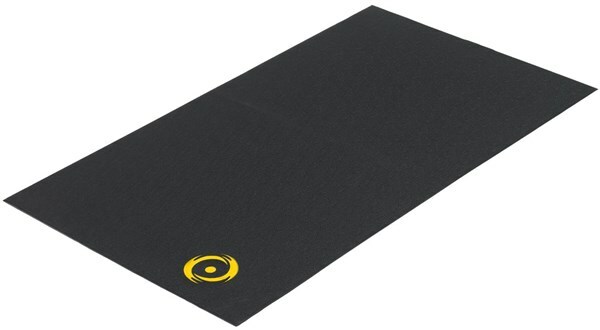 The Cycleops training mat is perfect for those indoor training sessions. Nonslip and noise reducing - brilliant. What are turbo trainer accessories? Turbo trainer accessories enhance your turbo trainer experience. They will protect your furnishings and help you achieve the best results when you’re riding indoors. Not to mention make it a fun experience. Who needs turbo trainer accessories? Anyone who owns a turbo trainer! Choose from riser blocks to hold your front wheel in place and create extra resistance, to mats to prevent damage to your floor. There is also a great range of DVDs available which will let you experience iconic classic climbs or take in the scenery of foreign lands without needing to book a flight. There is a multitude of turbo trainer accessories that all complement each other. Turbo trainer accessories such as a new DVD will keep things varied, and really encourage you to train more often. You’ll then notice a real difference when you get back out on the road.